J. Darwin Gunnell, devoted husband, loving father, grandfather and great-grandfather, a well known Mesa Business, Community and LDS Church leader, passed away on April 29, 2010 at the age of 94. His legacy of dedication and generosity to his family, his community and his Church is unsurpassed. He was preceded in death by his wife Olive, of 53 years. Darwin is survived by his children; Brent (Laura), Lamoine (Susan), Steve (Rhonda), Douglas (Ellen), Kay Bradshaw (Mark), and Scott (Rachael); 35 grandchildren, 93 great-grandchildren and 9 great-great-grandchildren; his wife Dorothy and her daughter Rita Abbott Rhodes (Vaughn) of Tremonton, Utah. He leaves two brothers, Karl (Norene) and Grant (Alice) and one sister, Ruth Strong (Raymond). Darwin was born a twin, the 4th of 9 children to Charles B. and Myrtle Cutler Gunnell in Snowville, Box Elder County, Utah. His boyhood was spent in Howell, Utah where his parents had a dry farm raising Turkey red wheat. He attended grade school through the 8th grade, went on to Bear River High School graduating in 1933. He attended Utah State College in Logan before serving a 2 year mission for The Church of Jesus Christ of Latter-day Saints in the Western States Mission with headquarters in Denver, Colorado. Following his mission he married Olive Christopherson from Garland in the Logan Temple on July 5th, 1939. He then entered into partnership with his father in their extensive farming operations for 3 years. 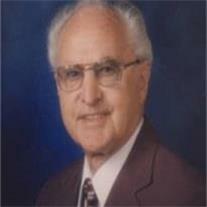 In early 1942 he moved his family to Mesa, Arizona to enter the tire business as a franchise operator with the O.K. Rubber Welders Company, a tire retreading and repair company. With the bombing of Pearl Harbor in December 1941, normal supplies of retreading materials were reduced as was the availability of new tires and his growing business was at the crossroads. He saved his business by recognizing he could repair tires found in salvage yards. This was the first of many opportunities he took advantage of as his business prospered over the next 40 years.